Pattern 3 of Tour de Sock is Indecisions, because the designer included a number of places where you could make a choice as you knit along. Either a ribbed cuff, or a folded picot cuff. Either a fancy heel or a slightly less fancy eye-of-partridge heel. Either continue the lace and cable motif down the top of the food, or just switch to a corresponding rib. Of course, this being a competition, we had restrictions on what we could do (no nice simple top-of-foot ribbing for us, in other words). There was a specific cast-on we were required to use if we wanted to do the ribbed cuff. I tried watching the linked YouTube video, but I quickly gave up on that – I had no desire to sit through a lengthy blather about how much the person in the video loves this cast on, blah blah blah, and I don’t mind a picot cuff all *that* much (plus there were bonus points available for the picot cuff). So I gave up on the new cast on, did the picots, and then just kept on going, including the fancy heel because, hey, more points, and why not. The pattern was released early afternoon on Friday. I ended up finishing the first sock in roughly 8 hours, and as far as I could tell from the chat and help threads, I was definitely at the head of the pack. I did cast on for the second and thought briefly about trying to stay up and finish it, but previous experience has taught me that knitting while one is in danger of actually dozing off while doing stitches only ends in copious amounts of swearing and unknitting later on when one is more awake. 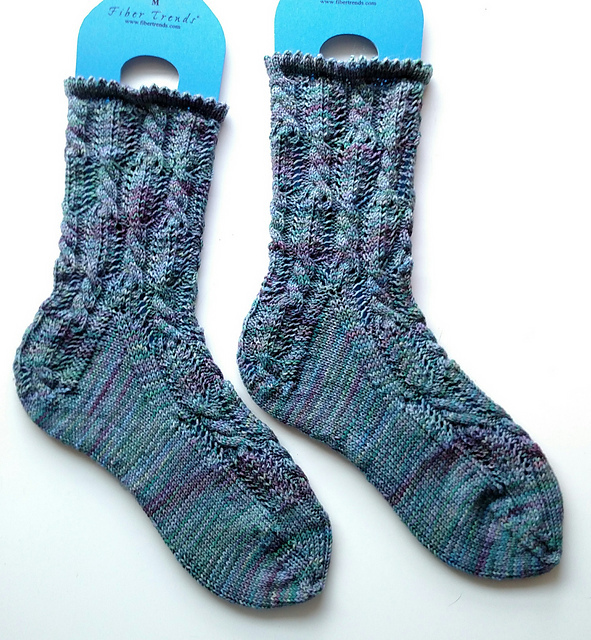 Thanks to insomnia, however, I ended up just waking up a couple hours later and getting back into it…which means I managed to finish this pair of socks in less than 24 hours. Yay. I blearily took pictures, tried to massage the cramps out of my hands (because ow), and sent off the info. Later on, it was confirmed – I came in 9th. I am quite pleased with those results. It’s higher than I ever expected to finish for any of the patterns, considering there’s a couple teams in Finland who have all been routinely finishing theirs in shorter periods of time. Will I be trying to do any of the remaining Tour de Sock patterns this quickly? Ha, I don’t think so. My hands aren’t happy with me, and I suspect I won’t be quite so ‘lucky’ as to have so much free time around when the patterns are released. Good enough that I did it once. That’s more than enough.